Bilinear systems under output injection equivalence are considered. 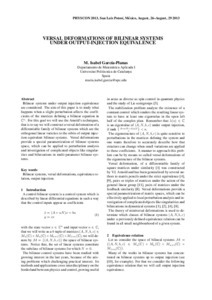 The aim of this paper is to study what happens when a slight perturbation affects the coeffi- cients of the matrices defining a bilinear equation in C n . For this goal we will use the Arnold’s techniques, that is to say we will construct a versal deformation of a differentiable family of bilinear systems which are the orthogonal linear varieties to the orbits of output injec- tion equivalent bilinear systems. Versal deformations provide a special parametrization of bilinear systems space, which can be applied to perturbation analysis and investigation of complicated objects like singular- ities and bifurcations in multi-parameter bilinear sys- tems Bilinear systems under output injection equivalence are considered. The aim of this paper is to study what happens when a slight perturbation affects the coefficients of the matrices defining a bilinear equation in Cn. For this goal we will use the Arnold’s techniques, that is to say we will construct a versal deformation of a differentiable family of bilinear systems which are the orthogonal linear varieties to the orbits of output injection equivalent bilinear systems. Versal deformations provide a special parametrization of bilinear systems space, which can be applied to perturbation analysis and investigation of complicated objects like singularities and bifurcations in multi-parameter bilinear systems. Garcia-Planas, M.I. Versal deformations of bilinear systems under output-injection equivalence. A: International Scientific Conference on Physics and Control. "Conference Proceedings 6th International Conference on Physics and Control". San Luis de Potosí: 2013.